Parking on Kangaroo & 2 paths from Lindholm Road. The park is at the geographic centre of Metchosin, and was initially a large property identified early on for its potential as water supply for the area. But instead of creating a reservoir out of Blinkhorn Lake, the Capital Regional District water department brought water mains from Sooke. The land was declared surplus and was transferred to the municipality as parkland in 1998. Lucky Metchosin. 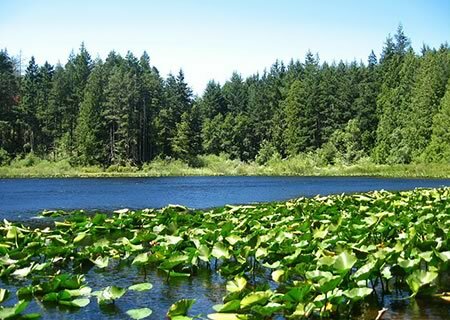 Today, there's a round-the-lake trail fringes the little lake through the forest of Douglas fir and western red cedar that was logged decades ago. A recent trail work project added gravel to muddy sections, so for the first time it should be an all-season walking and running path. Between the trail and the lake on the south side, just on a small rise there are the remains of a cabin of undetermined age, and a huge deciduous tree. It's not one of the broadleaf maples common to wet areas on the coast. The lake's outlet stream on the west side flows into Veitch Creek lower down, and ultimately into Sooke Basin. Who was Blinkhorn? That's Mr. Thomas Blinkhorn to you Metchosinites who got here after he did in 1851. He was born in Sawtry, a village about 40 kilometres northwest of Cambridge, England. Described in one account as "by far the most energetic settler on the island," Blinkhorn partnered with another early settler, James Cooper, and managed Bilston farm for him, site of today's Metchosin Golf Course and Witty's Lagoon. Later, he also managed William Fraser Tolmie's farm, Cloverdale, in Victoria. James Douglas appointed Blinkhorn the colony's first chief magistrate and justice of the peace for Metchosin district in 1853. A fall through ice into frigid waters impaired his health, and Blinkhorn died in 1856 at the age of 50. The lake and adjacent 259-metre-high Mount Blnkhorn (not inside the park boundaries) were named for him.